Since 1984, we at West Indies Spice Company have searched the world over to find the best herbs, spices, fruit juices and flavorings. We combine these quality ingredients into the world's finest naturally brewed marinade - PIRATE'S GOLD!! Pirates' Gold is a fast acting, all-purpose marinade; a delicious blend of exotic spices that brings out the hidden treasure of flavor in Beef, Pork, Poultry, Wild Game, Seafood and Vegtables. 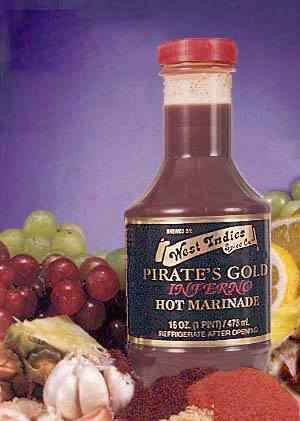 Pirates's Gold is also great as a basting sauce or a substitude for soy sauce in your favorite recipes. Pirate's Gold is naturally brewed, fat free and contains no MSG. Pirate's Gold is available in two versions - Pirate's Gold Original Marinade and Pirate's Gold Inferno Hot Marinade. As the name implies, Inferno is a hotter version of Pirate's Gold, it is hot. The longer you marinate something the hotter it will be; it's great for chicken wings. Pirate's Gold is available at fine Supermarkets, Meat Markets, Specialty and Gourmet shops throughout the Southeast United States. BI-LO, Harvey's, Publix and Winn Dixie are just a few of the fine retailers that stock Pirate's Gold. If you can't find Pirate's Gold Marinades at your favorite retailer you can order them direct - see our order page.